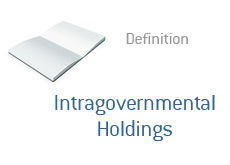 Intragovernmental Holdings - What Does It Mean? What is the definition of "intragovernmental holdings"? What does "intragovernmental holdings" mean? Public debt is any money that is owed to investors, foreign governments, mutual funds, hedge funds, pension funds, foreign investors, etc. "Intragovernmental holdings", on the other hand, is money that the government basically owes to itself, because it borrowed the money from itself. How does the government borrow money from itself? Let's take the Social Security fund as an example. The Social Security fund is administered by the government. Historically, the Social Security fund has taken in more money than it has paid out. What does a government, that almost always posts a budget deficit, do? It borrows from the Social Security fund, promising to repay the money at a later time. An IOU from the government, to the government. If there is any excess money sitting around in a government-adminstered program, then there is a good chance that it will be borrowed to fund deficit spending. The problem, of course, is that this money will have to be repaid in the future. The Social Security fund has been a great source of funds for the federal government, but these days are rapidly coming to an end.